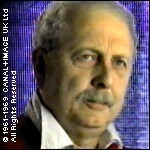 Born 1931 in Croydon, Surrey, Brian Clemens—writer, director, producer, even composer—knew he would be a writer from the age of five, and so his father wisely bought him a typewriter. After a stint in the Army, he got one of his first breaks in 1955 with a play for the BBC called Valid for a Single Journey. He was working for J. Walter Thompson Advertising at the time. Soon thereafter he joined the Danzingers, a second-feature production company. It went like this: the Danzingers would move into a studio and inherit the sets of the previous production. Clemens would then be set to task to write a screenplay for a film of any genre that featured these leftover sets. So, he might devise, say, a love story that involved a chariot race and a submarine, or whatever was on hand. He wrote upwards of 38 second-feature screenplays, the most notable being An Honourable Murder, a retelling of Julius Caesar in a boardroom setting. His first big break for television writing came next when he wrote the pilot for Danger Man (known in the U.S. as Secret Agent). The pilot, "View from the Villa," was set in Italy, but the production manager moved it to Portmeirion, which looked like Italy, but was much closer. Evidently the location stayed with Patrick McGoohan, since that's where he shot The Prisoner. 1960 was a pivotal year for both Clemens and The Avengers. ABC didn't like their series Police Surgeon, but they did like Ian Hendry, so Sydney Newman came up with an idea for a new series, and while he had no idea what it meant, he was convinced The Avengers was a great title. He called in Clemens, gave him the title and the two lead characters, and said "do something with them." So Clemens and another writer, Ray Rigby, together turned a story by Patrick Brown into a two-hour pilot that was broadcast in two parts, "Hot Snow" and "Brought To Book." Clemens describes the early Avengers series as being like No Hiding Place only not as good. The next milestone came in 1964 when he was teamed up with Albert Fennell to begin producing The Avengers on film, which was a significant point for the series, since it was now almost entirely under Clemens' control. This proved to be a great education for Clemens as he was unfamiliar with the process of film production. As the series' script editor, he worked very closely with Fennell and came to understand in particular the power of good film editing. Clemens is credited for making the series the wildly popular show it has become. One of the ingredients of its success was the minimalist fantasy world he created, which was originally born out of necessity due to the limited budgets; he recalls begging the studio for enough money to film in color (for the fourth season), and was told, no way—that's £3,000 more per episode we're not wasting. He likens his version of The Avengers to a Doris Day comedy because, in his words, "it has no upstairs, no lavatory, no drugs, black people or social problems." It was also uncompromisingly British. Keenly aware of the need to sell the series to America, Clemens was careful not to ever feature an American on the show. His focus was on making something that America could never produce: a sophisticated thriller. As for the stark differences between The Avengers and The New Avengers, Clemens explains that he knew the original had limited appeal—that is, it was never understood by mid-west America, and he very much wanted to develop something for this audience. Essentially he was shooting for a glossy, British version of Starsky and Hutch. However, he was unable to realize the show as he'd envisioned it because the French backers insisted that Patrick Macnee be in the cast. This and various other problems—notably shooting in France and Canada—resulted in a troubled, much maligned and short-lived series. Life for Clemens after The Avengers has been productive and reasonably successful, working in film and television, as writer and producer. Perhaps his most ambitious film projects are Doctor Jekyll and Sister Hyde (1971), which he wrote, produced and composed a song for, and Kronos, a.k.a. Captain Kronos: Vampire Hunter (1973, featuring Ian Hendry), which he wrote, produced, and directed. One of his better-known efforts in television is The Professionals (1977). He attributes this series' success to a simple formula: the two male leads were modern heroes that male viewers wanted to be like and female viewers wanted to get into bed with. While it would seem he never got a great many offers for work, he says that he got as much work as he wanted, although he concedes that British television is not what it used to be. Brits can no longer smugly think of American television as crap, he maintains, because the quality of British television is diminishing. Clemens won a British Academy Award (BAFTA) for the creation and production of his comedy series My Wife Next Door, and his work was recognized in North America when he won the Edgar Allan Poe Award for thriller writing in 1963. He currently resides in Ampthill, Bedfordshire. He is still working today (and still using a typewriter, not a computer), and considers The Avengers to be his "Golden Years." Clemens was appointed Officer of the Order of the British Empire (OBE) in 2010. He married his first wife Brenda Prior in 1955; they divorced in 1966. From 1967, he was with actress Diane Enright, who was Diana Rigg's stand-in as Emma Peel; Enright committed suicide in 1976. He then married Janet Elizabeth, with whom he had two sons; they stayed together until his death on 10 January 2015 at the age of 83.